The properties of soft-matter thin films (e.g. liquid films, polymer coatings, Langmuir-Blodgett multilayers) nowadays play an important role in materials science. They are also very exciting with respect to fundamental questions: In thin films, liquids and polymers may be considered as trapped in a quasi-two-dimensional geometry. This confined geometry is expected to alter the properties and structures of these materials considerably. 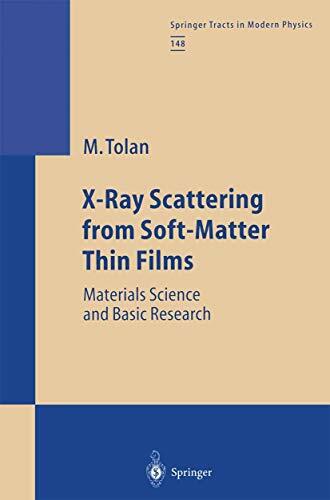 This volume is dedicated to the scattering of x-rays by soft-matter interfaces. X-ray scattering under grazing angles is the only tool to investigating these materials on atomic and mesoscopic length scales. A review of the field is presented with many examples. "The book is well referenced and clearly conveys materials systems and behavior that are amenable to characterization by thin-film scattering techniques. It should be an asset to any research group beginning, or currently involved in, the characterization of thin films by x-ray diffraction."